Before rice was widely consumed in Asia, it is believed that millet was the staple grain. Millet is the world’s sixth most popular grain with India, Africa and China being the top producers. Technically, millet isn’t just one grain, but the term used for a group of seeds from several different species of the grass family. There are 4 major types of millet grown worldwide, Pearl, Foxtail, Proso and Finger. 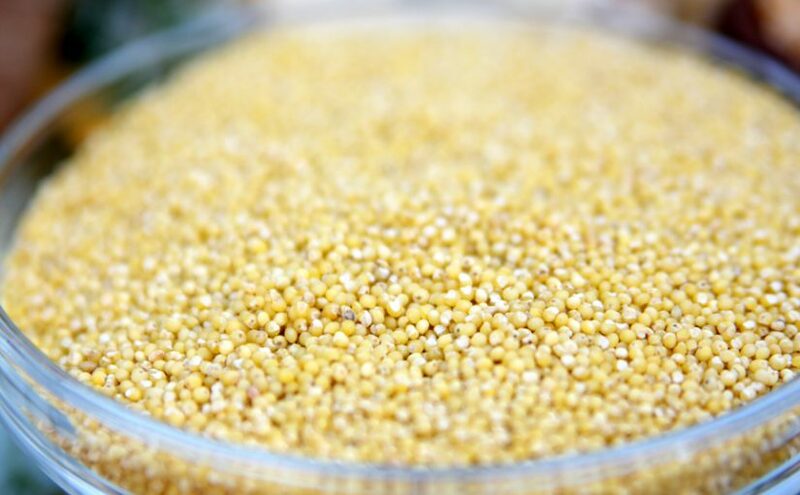 Although millet is an ancient grain, its health benefits have only recently been studied. As a grain, millet is naturally gluten-free and is particularly easy to digest and is considered by some to be the least allergenic of all the grains. Millet is a good source of magnesium, a mineral so important for nerve function. Millet is particularly high in proteins and antioxidants and like most grains play and important role in controlling blood sugar and cholesterol levels. 1 cup serving of cooked millet provides 6 grams of protein. In cooking and baking millet is quite versatile. In Asia and India, millet is most commonly eaten as a hot porridge or breakfast cereal much like we eat oatmeal. Millet can be coarse ground and substituted for corn for grits or polenta. Millet can even be popped and enjoyed like popcorn. Millet flour can be added to other flours used baked goods, but for a good rise and texture no more than 25% millet flour should be used. Uncooked whole millet may be added before baking to give a nice crunch to baked breads. Americans are most familiar with millet as its use in birdseed, but it is far too nutritious and delicious to just be given to the birds. So I look for ways to use this small, yellow, nutty little grain. My favorite use is to just add it directly to breads, muffins or cookies. The sweet, little crunch and color it provides is a welcomed addition and can be a nice substitute for nuts. Fluﬀy Millet – toast 1 cup millet for 4-6 minutes in a dry pan then add 2 ¼ cups boiling water, simmer 13-18 minutes, then let stand 10 minutes. Sticky Millet – Bring 1 cup millet to a boil in 2 ¾ cups water, simmer for 13-18 minutes, then let stand 10 minutes. Sticky millet can be molded in croquettes and patties. Creamy Millet – Grind 1 cup millet in a spice grinder. Bring 5 cups water to a boil, then gradually whisk in millet. Cover, lower heat and simmer, stirring occasionally for 15 to 30 minutes until grits are tender. Makes a great porridge or polenta. The recipe below is one of my new favorites. I call it Millet “Mac and Cheese”. Served hot and bubbly from the oven, taste testers couldn’t believe it wasn’t a traditional pasta “mac and cheese”.